Would You Take This Masterpiece Submariner 16618 Into The Seas? The story of the Rolex Submariner is an illustrious one making history in 1953 as the first ever dive watch water resistant to a depth of 330 feet (100 meters). Positioned as a tool watch, it was equipped with a rotating bezel to keep track of time spent underwater and luminescent details for visibility in the marine darkness. Over the years, the Submariner has undergone countless improvements, as well as a great number of differing looks using a range of materials, colors, and design details. 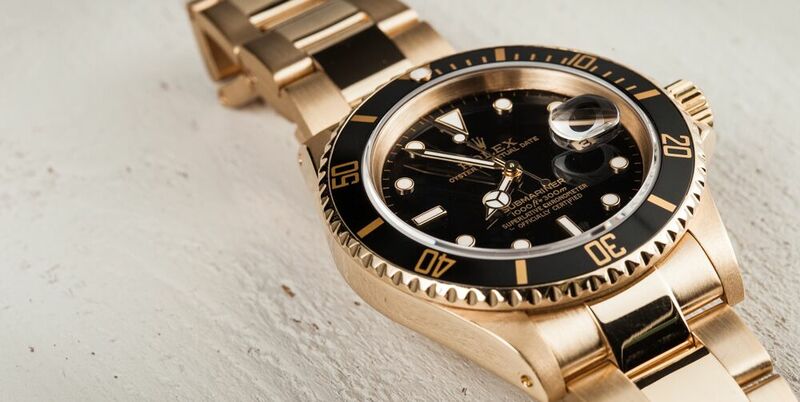 The Rolex Sub still remains the gold standard in luxury diving watches. Rolex Submariner was the first ever dive watch water resistant to a depth of 330 feet. The Submariner 16618 watches were the brand’s full 18k yellow gold offering during the late 1980s until 2010. Bearing all the characteristics of the iconic diver’s watch – 40mm Oyster case waterproof to 1,000 feet, screw-down crown, unidirectional graduated diving bezel, date window magnified by the Cyclops lens, and Oyster bracelet. The Rolex Submariner 16618LN is a watch with a few variations. As a full 18k yellow gold model, the ref. 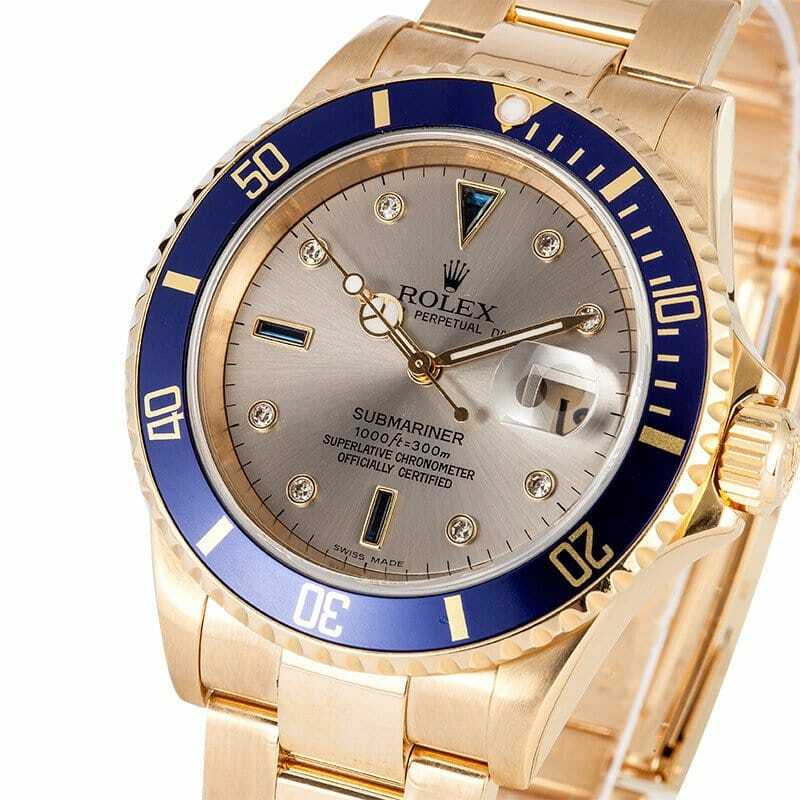 16618 was the ultra-luxurious version of the Rolex Sub dive watch and several dial and bezel configurations were available. There’s the black dial and black bezel reference (16618LN), as well as the blue dial with matching blue bezel one (16618LB). These two options come equipped with the large luminescent hour markers and luminescent Mercedes style center hands for perfect legibility amidst the murky waters of the deep. 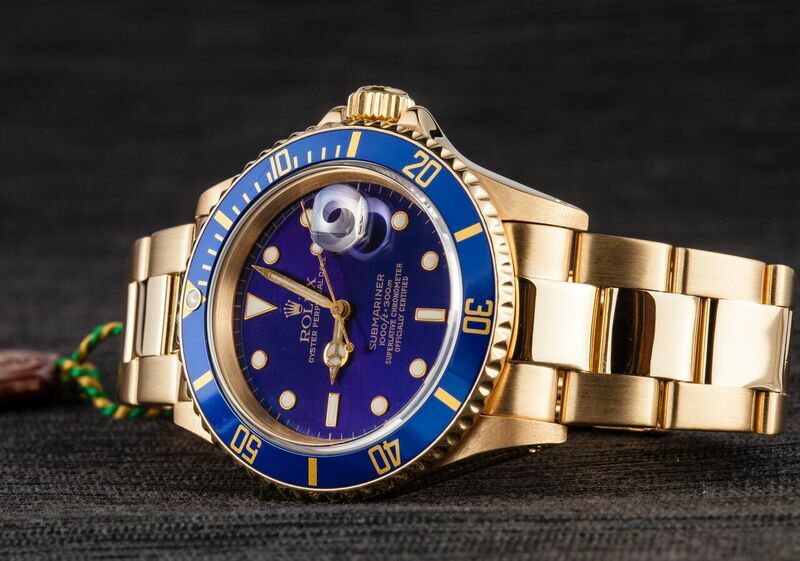 Would you take a masterpiece Submariner to the ocean? On the “Serti” dial varieties of the Submariner ref 16618, the dials shone bright for another reason – the diamond and sapphire gems dotted around the dial as hour markers. An even more precious variant is the mega rare ref. 16618 sporting a lapis lazuli dial – only a few were produced in the early 1990s. 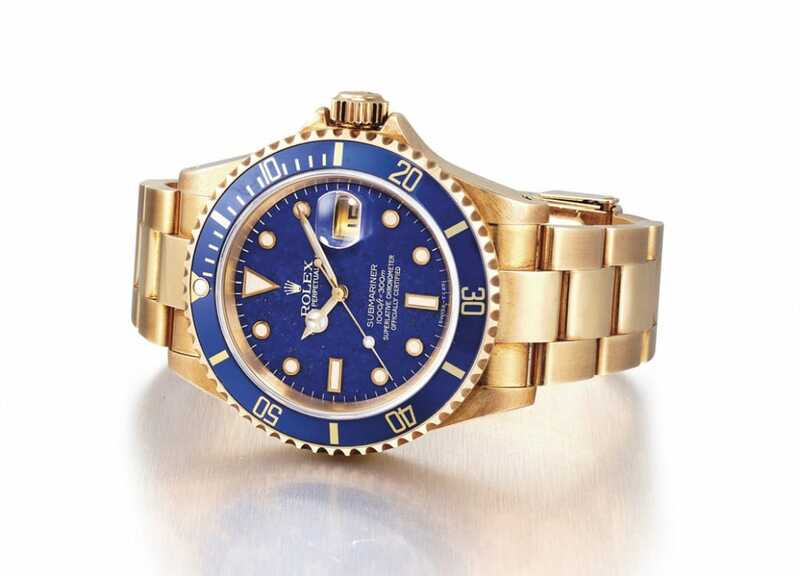 In 2011, Christie’s sold a Submariner ref. 16618 with a lapis lazuli dial for over $90,000 during their Important Watches sale in Geneva, while more recently, in 2014, they sold a similar model for over $84,000 at the Hong Kong Important Watches event. A fundamental element of Rolex watches is the supreme precision and reliability they offer. The 16618 watches are powered by the proprietary Rolex Caliber 3135 perpetual mechanical movement, which is still the movement found within the current collection of Submariners. Of course, the Caliber 3135 is a Superlative Chronometer Officially Certified, meaning that not only has it passed the stringent Swiss Official Chronometer Testing Institute (COSC) tests, but also Rolex’s own in-house battery of assessments. As a sports watch, the Submariner ref. 16618 greatly benefits from the Parachrom hairspring inside the caliber since it increases the watch’s resistance to shocks and temperature swings. Beautifully crafted, meticulously tested, and globally renowned, the now discontinued yellow gold Rolex Submariner 16618 is a treasure to behold.